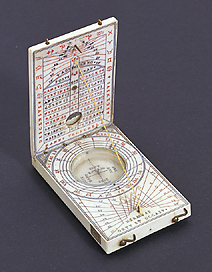 This ivory diptych dial has a horizontal string gnomon sundial which is adjustable for four latitudes. Inside the cover there is a table of latitudes and in the corresponding holes the string gnomon joined to the opposite end of the base can be inserted. The shadow of the wire, projected on the hour lines, allowed the hour to be determined. On the lid is a wind rose with a pointer and also a hole for reading the compass, located underneath. On the back of the instrument is a lunar volvelle, displaying the phases of the moon. The instrument is the work of Hans Troschel, an instrument maker from Nuremberg famous for his work in ivory.